Travelling for business can take it out of you, so anything that helps make your travelling simpler and more efficient has to be a good thing, and the long-awaited National Rail Enquiries app does all of that, and more. 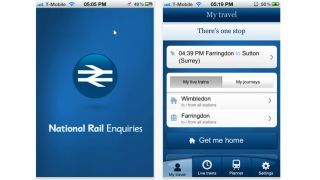 The app features many of National Rail Enquiries' website most popular tools including a real time journey planner and live departure boards, together with relevant and up-to-the-minute information about disruptions and stations. Two particularly unique features of the app include push notifications for automatic alerts of any delays or changes to specific train services, and the ability to plan a journey with real time information and check live departure boards without the need for an internet connection. The "get me home" function is also invaluable for anyone stuck in an unfamiliar place, it traces the user's location and shows different journey options from the nearest stations to whichever station is saved as 'home'. And for those Christmas parties, and for those who have too much to drink on Friday night and find themselves falling asleep, there's a helpful "wake me up alarm" to get you off the train when you get to your final destination. London travellers will also be happy to see that the app includes journeys to/from Docklands Light Railway and London Underground (Zone One stations).